Our next Tattooed Poet o' the Week is Catherine Bresner. The line that marches across Catherine's collarbone and around her shoulder is "mi corazón se cierra como una flor nocturna." "My first tattoo is on my collarbone and is a line from one of my favorite poets, Pablo Neruda. It is from his poem 'I Have Gone Marking', which is in Twenty Love Poems and a Song of Despair. The translation is 'My heart closes like a nocturnal flower'. I grew up near the ocean and in this way I suppose I have always felt a sort of kinship with Neruda. We both draw inspiration from the sea." 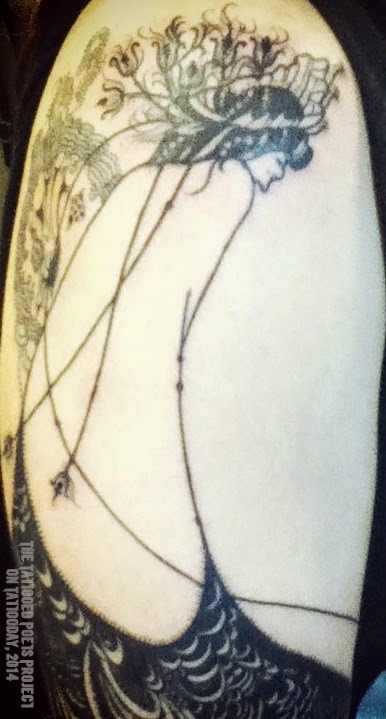 "My second tattoo is on my upper arm, and it is part of Aubrey Beardsley's illustration entitled "The Peacock Skirt" (1893). Aubrey Beardsley was an Art Nouveau artist and author. This is the image that Oscar Wilde used to promote his tragedy Salome, and it depicts the Syrian Captain of the Guard who casts his gaze on Salome. I am haunted by Beardsley's artwork, and by this picture in particular, because it is seductive and sinister. 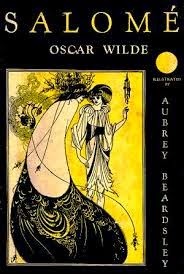 I also loved the story behind its origination, as Beardsley and Wilde often collaborated together in order to create their art. Both tattoos were done by the very talented Tim Brewer, who owns a tattoo shop in Hadley, Massachusetts called Blueprint Gallery." like ivy from beneath floorboards; they nuzzle the skylight panes. Everything is sinuous and coy, each wallpaper detail like a belly dancer, exotic and surprising. Each lampshade, a crocus. Walls are not walls here. In the orange light of a sunset, the cherry wood glows like the first ember in a forest fire. This room gives off its own light. Catherine Bresner is the author of the chapbook The Merriam Webster Series. She was the editorial assistant of Pilot Books, an intern for The Massachusetts Review, and a participant of the Juniper Summer Writing Institute. Her poetry has been published in The Pinch, H_NGM_N, and Burntdistrict and has poetry forthcoming in The Cream City Review and Yemassee, where she was a finalist for the Pocataligo Poetry Contest. She is currently pursuing an MFA in poetry at The University of Washington, Seattle, where she is the associate editor for The Seattle Review and an intern at Wave Books. Thanks to Catherine for her contribution to the Tattooed Poets Project on Tattoosday! Ohhhhhhhh! 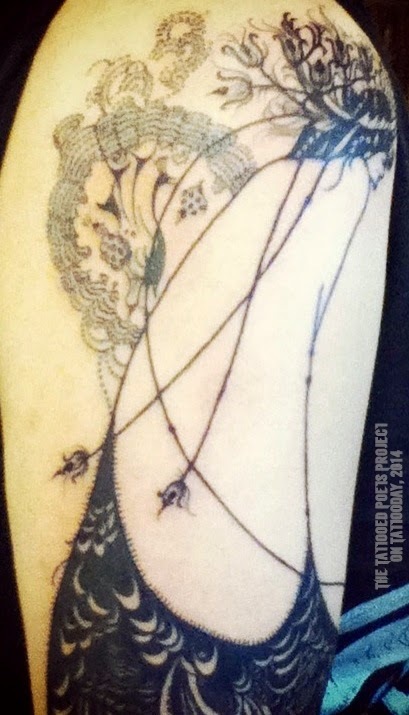 The Beardsley tattoo is fantastic! I knew just from seeing a wee portion of it on FB what it was.